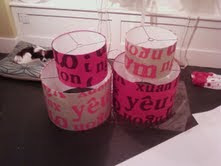 Here are some of the shades I have been making lately, lots and lots of letters! Floating whimsical words and captivating consonants, vowels in all shapes and sizes...please feel free to peruse.... "Truth or Dare", a shade done for the Shigo family in cream taffeta with letter pressed words by Lynda Sherman of Bremelo Press. The set of shades featuring Vietnamese characters for a project with Piano Nobile in Ballard.